16 Goytre Hall Wood at Goytre Hall Wood car park01633 644850work Walking RouteA short walk from the car park through the woods brings you out at the aqueduct of the Monmouthshire & Brecon Canal. Go under this and complete the loop shown on the information boards – through the woods to a canal bridge and back along the towpath. You cross the aqueduct and follow the canal until it meets a lane. Turn left down the lane and return to the car park. 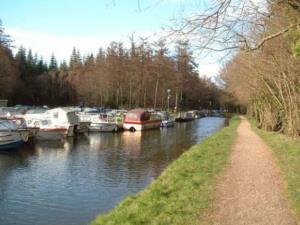 A short walk from the car park through the woods brings you out at the aqueduct of the Monmouthshire & Brecon Canal. Go under this and complete the loop shown on the information boards – through the woods to a canal bridge and back along the towpath. You cross the aqueduct and follow the canal until it meets a lane. Turn left down the lane and return to the car park. Points of interest include the industrial heritage which represents the most complete collection of buildings associated with the canal in the early 1800s. They can be found all around the wharf. The Saron Baptist Chapel and its nearby Baptistry is also of interest. Goytre Hall Wood is a beech woodland which is carpeted in bluebells in spring. Facilities at Goytre Wharf include toilets, shop, information, food. Some woodland and field paths, towpath and quiet lanes. Mostly level, but with some slopes in the forest.